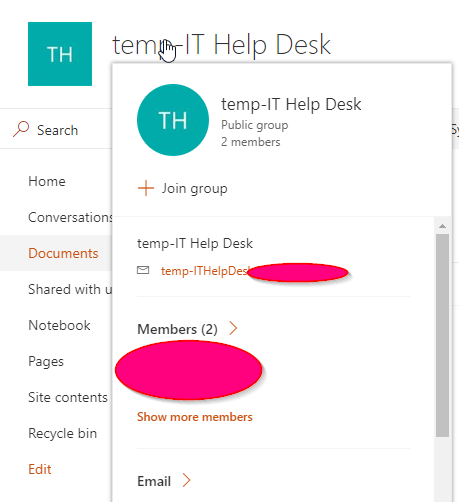 In the modern SharePoint interface for Group (Team) sites, if you hover over the team name in the top left corner of the site, it pops up with the contact card for the Group. Is there a way we can turn this off? We want to create the Team sites and give read access to other departments and we dont want them to access this contact card. Per my knowledge, there is no OOB way to do that. However, for modern libraries/lists' view pages, there is no way to add custom code currently. So, I am afraid that you are unable to achieve it. Not the answer you're looking for? Browse other questions tagged sharepoint-online office-365-groups modern-team-site or ask your own question.